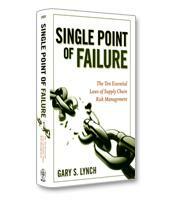 In Single Point of Failure, internationally recognized industry veteran Gary Lynch reveals the 10 vital laws you can use to successfully identify, measure, mitigate and finance risk. Lynch offers guidance for establishing your organization's supply risk management program, avoiding bad decisions and gathering better information and data to make good decisions. You need to learn the root causes of problems and decide whether you have the proper systems in place to mitigate risk. Addressing risk from several points of view, this summary shows you how to remain agile to avoid risk, be resilient to absorb risk, develop sustainable methodologies and maintain risk solutions. How to establish your organization's supply risk management program. Why no risk strategy is a cure for bad decisions. What causes supply chain risk management demand to trump supply. Why managing the parts does not equal managing the whole.